March has arrived and its time to start thinking about spring. It’s a perfect time to pull out your old family photos! I’m going to focus on different types of photographs by era and how you can use information about the size, material and features to determine an approximate age. Let’s start from the earliest known type of photos and work our way up to the 20th century. This photo is a cased image, meaning you won’t find it loose in your collection. Often times these would be placed between plates of glass in its early history and later many ornate cases were developed to display it. 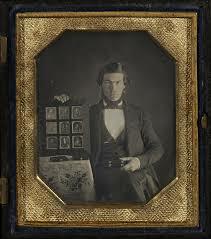 Daguerrotypes first appeared in 1839, but most people report images from the peak period of 1842-1858. These photos were still produced until 1862, but weren’t as popular in later years due to advances of other types of photos. How do you know if your photo is a daguerrotype? If its under glass or in a case that’s your first clue. When you look at one, you’ll notice it has a mirror-like surface. Some of the common sizes included 2 ⅝” x 3 ¼” and a 2”x 2 ½” size. Ambrotypes first appeared in 1854, but they were most popular from 1856-1860. Popularity started fading after that and by 1866 they weren’t being produced anymore. An ambrotype is an image on glass and you will also only find it in a case. It may be easy to confuse these with a tintype (which we will talk about next). Common sizes included a 3 ¼”x 4 ¼”, 2 ⅝” x 3 ¼” and a 2” x 2 ½” size. Tintypes appeared on the scene in 1855 and were most popular 1861-1871. However, it's important to note that after 1871, tintypes tended to be a novelty at fairs and events and were available through 1900. Tintypes are created on an iron plate. In the early years they appeared in a case, but later they were mostly loose. You can easily tell a tintype from an ambrotype by looking at the back. The back of a tintype will look metallic. Special caution: Do not open an ambrotype cased image! It’s very easy to damage the photo with the slightest touch. Common sizes include 3 ¼” x 4 ¼”, 2 ⅝” x 3 ¼”, 2” x 2 ½”. CDV, an abbreviation for Carte-de Visite, was first seen in 1859. They were most popular from 1863-1877, but you would still see some produced as late as 1882. These photos are pictures on a thin paper and then mounted on thick card stock. The earlier images were thinner and as time progressed they became thicker. Most of these photos have a sepia tone to them. They were almost always 2 ⅜” x 4 ¼” making them fairly easy to identify. The back of the CDV. Mounting on cardstock gave photographer's the ability to identify themselves and advertise their studio. Family’s tend to have more of these photos in their collection since they survived more often than the earlier photos. Cabinet cards first arrived in 1866, but were most popular from 1875-1895. You do still seem some cabinet cards being produced through 1900. Cabinet cards are like CDVs in that they are an image produced on a thin piece of paper and then mounted on a piece of card stock. The earliest images still contained the sepia tone, but later photos showed more sharp silver and black tones. You will notice different types of edges on cabinet cards depending on their age and the style of the photographer. Most cabinet cards are 6 1/2 “ x 4 ¼ “, but you might occasionally see another size. These photos will vary greatly, but essentially if your photo does not display any of the characteristics of the photos above, it was likely created from about 1895 and later. One popular type was a real photo postcard (RPPC). This was a personal photograph with a postcard printing on the back so you could send it to family friends. This is a very basic overview of different types of photos, but there are many other clues in photographs you can use to help date them even further. I’ll be speaking at the Downers Grove Library on May 10th if you'd like to learn more about how to piece together the clues. For more details and to RSVP: Check out the event here! Do you need help identifying your old photographs? Contact us with your questions. Since I discovered the box of my family’s belongings that was left in an attic for 60 years, I’ve been obsessed with treasure hunting. The treasure I’m looking for is anything from the past pertaining to my family history or the Morris, Illinois area. I’ve gone rifling through family member’s basements and photo albums, knocked on stranger’s doors to look through attics and scoured eBay to find more trinkets to add to my collection. I have found a few things in my search, but nothing compares (or likely will ever compare) to my original find. Still, my search continues. When I saw that someone posted about a box full of miscellaneous papers and pictures in Morris on Facebook Marketplace, I contacted them immediately. We arranged to meet and I soon learned that the seller was the owner of the store, Clutter, located at 115 W. Washington St in downtown Morris. Clutter is a new addition to downtown and opened just this past June. Melissa and her family moved from Pennsylvania after her husband’s job was transferred to the area. She has been dealing with euphrema and other vintage finds by hunting through estate sales, flea markets and abandoned buildings for the past 13 years. She’s got a passion for treasure hunting and has been impressed with the response to the new store in Morris. Not only does the store sell all things vintage, but they also stock an impressive comic book collection and will be opening a new arcade area in their back room on February 1st. There’s seems to be just about something for everyone contained within the store somewhere. In the 1900 census, Leonard and his two children Frederick and Harriet were living with a family on West Washington Street. Leonard’s occupation was a tailor so we can safely assume the tailor shop at least dates back to this time. Leonard was a German immigrant born in 1848. He was a widow at this time and sole provider for his two children, Frederick age 14 and Harriet age 11. Moving forward, Leonard continued to operate his tailor shop; probably until around the time of his death in 1920. In the 1920’s, the shop was known as Kausch and Olson and continued to operate as a tailoring business. William Kausch and Thor Olson appear to be the proprietors of this business after working for Mr. Erlbacher. Kausch likely began as an apprentice as the 1900 census shows him working at a tailor shop at just age 14. Olson, a Norwegian immigrant, shows up in the 1910 census with occupation as tailor. By 1930, Thor’s son Raymond works as a clerk with his father in the shop. While there isn’t a lot of of direct information about this location during the 1930’s, it’s safe to assume it remained a tailor and cleaners through this decade and into the next. By 1942, it was listed as Olson Bros Tailors and Cleaners. In more recent history, The Black family owned it for an extended period of time operating a law office out of the location from the late 1960’s into the mid 1980’s. Dorothy Black also ran her real estate business from this location. Theresa Lamb, daughter of Dorothy Black recently provided me this photo of her Grandfather's Saloon that was reportedly on W. Washington St. The Tailor shop could have been next door to the left given the pictures of the men in clothing and the letters "ssing" (maybe Pressing?) in the window. While 115 W Washington at first glance doesn’t appear to be a memorable place in Morris downtown history, it holds generations worth of importance and livelihood to at at least four families throughout the years. Each family left a legacy of history that took a little digging to uncover so it could be remembered again. Do you own a Morris business or are curious about your house history? Contact Modern Ancestry to learn how you can discover the forgotten history. The Thrilling Conclusion: Family Fortune or Faux Lore? I had discovered a gold mine of information. So many questions revolving around this infamous family story were finally answered! But many more questions still remained and how did the paper trail match up with the details in the letter? I started to look at the cast of characters presented in the letter first to determine if I could uncover more facts in this fantastical story. While we do have some ancillary characters such as the minister of the Foveran parish and the lawyer, Mr. Grove, it’s unlikely their histories would lead to more information about the case. The writer of the letter (a cousin of Jeanette’s) was unknown. It must have been on her maternal side (who married into the Innes family). It was most likely a relative still living in the UK that never came over to the U.S. Jeanette’s grandfather John Steel had a sister Martha and a brother, Henry. The writer talks about “their fathers” indicating that this could be the son or daughter of Henry Steel. The Scoundrels Mitchell--they certainly sounded like the type to go around digging up graves and altering parish records by the way the person spoke of them in the letter. After Jane died, its well documented who inherited the fortune. William Innis was the cheif cashier of the Royal Bank of Scralnd from 1808-1827. The claim was that William was the “nephew” of Gilbert Innes, but when looking at the records and others’ careful research it looks like he was a cousin once removed. He was considered the closest kin despite the many illegitimate children who tried to make the claim. After he inherited the estate, he started calling himself William Mitchell-Innes. He later acquired Ayton castle sometime later by unknown means. It appears this Ayton castle (not associated with Gilbert Innes) is the castle from our family stories. Another example of how fact and fiction were intertwined into the the story. But was Gilbert truly related to our Innes family? Given the names in the letter, the writer provided some helpful dates of marriage and a birth of a son. Records reveal that a William Innes (b 1702), son of a different Gilbert Innes was married in 1727 in Foveran to Jannet Ray. Their son Alexander was baptized in Foveran in 1731 and married Helen Mitchell, 1768. They had a son also named Alexander around 1771 in Foveran. This Alexander seems to who the writer is referring to in her letter to Jeannette stating its the great great granfather of Jeanette. This would make Elizabeth Innes’ (who married Joseph Steel) the daughter of Alexander Innes and Helen Mitchell.This matches up to the dates provided in the letter, but is clearly not the same Gilbert Innes of Stow. Looking at it another way, Elizabeth Innes (the known grandmother of Jeanette), the mother appears to have been baptized 20 Jul 1783 in Stockton, Durham, England daughter of Alexander and Elizabeth Inness. So her father Alexander and the Alexanders of Foveran mentioned above also do not mesh in space and time. Families trying to make claim to this estate were not uncommon. You can imagine with 67 illegitimate children, there were many who insisted that they were the rightful heirs. It’s also quite plausible that lawyers and solicitors tried to take advantage of this sensationalist story. Maybe they made a claim that with enough money the fortune could be yours and it didn’t matter if you were giving up a sizeable amount of money now, just think of the millions you’d eventually be entitled to! The letter certainly has some suspect language alluding to that. If you notice, the writer mentions the need for money twice. Once when he or she says “this action will cost a lot of money” and another time “I have thought of getting the money through a syndicate but as you will know they will want to be tremendously well paid,”. Many of the facts do not match up to the paper trail and it would all be unknown to the family back in the U.S. Coincidentally shortly after I found the letter, my distant cousin (and genealogy partner in crime!) Nancy was traveling to Scotland. She was going to be within driving distance of the Ayton Castle. We discovered that it was for sale and our family joked about purchasing it and bringing it back to the rightful heirs. Nancy planned on driving to the castle and walking around the grounds. She was later invited in for coffee and was able to experience the castle all of us had heard about for years and years, yet had little information on its whereabouts. After her return, the paper trail and research grew cold, but more research continues to come out about the mistresses of Gilbert and his many descendants. The conclusion of my search revealed there were some truths in the family lore we heard all those years. While we don't know all of the details to this long told story, many family members found enjoyment and a thrill finding out there was some truth to the story and some of the details that plagued us for years. Who knows, maybe someday our Innes family will be included in a list of Gilbert Innes’ known descendants, but for now we’ll continue to tell future generations (a little more factually) the tale of the fortune and how our family was (maybe) swindled by the Scoundrels Mitchell! Want to share your family lore story with Modern Ancestry? Contact us to find out how we can help unravel the mystery. I blinked a few times and refocused my eyes. Was this letter really what I thought it was? I am now back from Scotland and the result of my journey is beyond even my expectation. After days of fruitless search we at last hit upon Feveran as our last resort, Mr. Grove had to return to St. Albans but left me to make enquiries. The result is that I found some old inhabitant who knew about the Innes case. There is an old man named Low the son of the grave digger at Belhelvie Church still living. It was his father who allowed the Mitchells to get a hold of this book and tear out the leaf which contained a record of William Innes’ burial and he also had a hand in the removal and burying of the grave stone. I saw Low but he will not speak although anyone with half an eye can see that he knows a great deal of what his father did in the matter. A man named Stott had the idea of the stone to see and he was assisted by a man named Duguid. Both Stott and Duguid are dear but their children are alive and live at Newburgh. Stott has not been dead many years but he was a notorious bad character and from inquires that I made, in his lifetime he could always get what he liked out of Captain Mitchell. By the advice of the Reverend Loutit the Minister of the Parish, I did not see Stott’s eldest son as he is a bad lot but if we need be we will have to approach him a fair sum of money to open his mouth. Well I found Duguid’s, stone but it was only after I had been at him for four hours that he at last told me that it was said that his father had a hand in the moving of the stone but he did not believe his father knew what he was doing. He went with me to the Church yard and showed me the part of the graveyard that the stone was hidden in. I got the present grave digger and we probed and probed the ground and also commenced digging but up to the time I left we had not found the stone and I have the matter in very good hands and I am daily expecting to hear the result of the search for the stone. In the same church yard is a stone of Gilbert Innes who was William’s father. Having found the parish William was buried in, I went to Edinburgh and I found a record of his marriage in 1727 and also a record of Alexander’s birth in 1731. Alexander is our great great grandfather. How on earth a man can die in 1722 and get married in 1727 and have a son in 1731. I don’t know but this we will leave to the scoundrels Mitchell to explain. Of course the missing links in the other action which was commenced in 1858 was that they could not find William’s marriage, whether he had any issue and where he was buried. I have found two of the missing links and I do hope we find the missing stone but even if we should not we have more to work with than our fathers had but with the stone I do not see how we can possibly fail in our claim. This action will cost a lot of money as you can rest assured the Mitchells will have a strong fight for it .How are we to raise the necessary money? I have thought of getting the money through a syndicate but as you will know they will want to be tremendously well paid in the event of our success. If you can, I think it will be far the best if you come over as so much has to be arranged and we could better discuss our ways and means of fighting the action and the sooner we get to work the better. No time ought to be lost. Find the stone and I don’t for the life of me see how we can fail. And what a success it would be. Miss. Jane Innes left over a million pounds in securities and the estate was worth another million. We shall be entitled to be refunded the profits on these two sums over sixty years so I love you to calculate the numerous sum we shall be fighting for. Fortunately the Mitchells have not squandered the money but have increased it and all though they will probably be ruined, I think all together they would be able to repay what they have had. I don’t see that we should show them any mercy. They got the estate and money by absolute fraud and delivery of the word kind. I would come out to you but I think it would be far best for you to come here so as to be on the spot. What a story! Records were revised illegally, gravestones were hidden and a mystery relative grilling a cast of bizarre characters to end up digging in a graveyard. Not only did the letter paint a picture of a fantastical story, it also gave credibility to many of the foundations of our original family lore. There was a fortune, our family was trying to claim it and it it was under some very mysterious circumstances where a coverup (or perceived coverup) was taking place. However, some of the details (important ones) were misconstrued. The letter mentioned the last name Innes. Fortunately, I knew where that name came from and it was a lot further up on my tree than I anticipated. Jeanette’s parents were William Ferguson and Mary Steel. Mary was born in England and her parents were John Steel and Elizabeth Scott. At some point Elizabeth had died in England and after her death was when John Steel appeared to have “stolen” another man’s wife and came to the U.S. I knew that John Steel’s parents were Joseph Steel and Elizabeth Innes. Here was the link! I started googling Alexander Innes in hopes to find some account of a large trial to further research what exactly happened with all of this. I knew we didn’t end up inheriting 60 million pounds, but did any legal proceedings occur and what actually happened with this supposed lawyer getting murdered. I couldn't find a thing about Alexander Innes, so I started googling the other names mentioned in the letter. First William Innes and I came to nothing conclusive. Then I tried Gilbert Innes. Jackpot. Gilbert's life and fortune were well documented. Turns out Gilbert Innes was the director of the Royal Scotland Bank for 45 years (1787-1832). He was known as the richest "commoner" in Scotland at the time. He never married and when he died in 1832 his sister Jane inherited his estimated 1 million pound fortune. When Jane died just 7 years later, she had no will. That's when people came out of the woodwork, trying to find a way to make claim to the fortune. Part of the problem was due to Gilbert's....social life. Its believed that he may have fathered up to 67 illegitimate children. Many of them tried to make claim to the fortune. Jane had supported some of these children during her life by providing money and investments for various projects, but some were likely not true descendants. In fact, that's where the answer lies in what happened to the extraordinary fortune. The letter mentions the Mitchell family. It's clear whoever the writer of the letter is does not think much of them, referring to them as the scoundrels Mitchell. "But what did eventually happen to the Innes' fortune? Legend has it that it was inherited by a Mitchell family who had sent people around Scotland to alter parish records and deface gravestones to legitimise their claim." Stay tuned for next week's conclusion! Did the scoundrels Mitchell steal the fortune from the rightful heirs? Were our Morris relatives entitled to the money? Find out how we separate fact from myth with genealogical research methods. Do you need help solving your own family mystery? Contact Modern Ancestry here to find out how. Everybody seems to have an incredible story about their family history that they hear at every family reunion and holiday gathering. The details are gray, seem to be ever-changing, but the core of the story everyone insists is true. Maybe you’ve heard you're related to a famous person or your family descends from Royalty. In my own family, we have family lore that’s been passed down through generations. But how can you confirm or deny the credibility of these family stories? One recurring family story says there were wealthy ancestors from Scotland (or England, according to some). I was told about two brothers who owned a castle, a lot of land and possibly coal mines. One day, one of the brothers ran away with another man’s wife and went to America. When the other brother in Scotland died, the brother in the U.S. could not return to claim the fortune because the wife’s husband was waiting for him. Other relatives tried to return to claim the fortune and even sent a lawyer over to help claim the money. That’s where the details get murky. Some of the accounts say that the lawyer was murdered. Others talk about a page of the family bible proving the family’s claim to the fortune was torn out and destroyed. We had found little to prove or disprove any of these claims. My great aunt Hazel had once told a relative that she distinctly remembers relatives returning from the trip and bringing her trinkets from England (which contradicts the Scotland story). A lot of the story didn’t add up. We knew that my great great grandfather John Steel coming to America with another man’s wife, but the Steel family did not appear to descend from any sort of royalty. They were gardeners in England, could not read or write and the paper trail showed no connection to this incredible story. If such a fortune actually existed, there had to be some kind of documentation talking about it. I found this article in my ancestors’ hometown paper, the Morris Daily Herald. It reveals that my grandfather’s Aunt Jeanette Ferguson McNabb was involved in the hunt for the fortune too. Mrs. Harry McNabb and Joe Steel, Cousins, Leave Morris in Quest of Fortune of 15 million pounds. Mrs. Harry McNabb and Joe Steel, cousins, left Morris this morning having secured passage to Liverpool, England. They are going in quest of a fortune estimated by some as high as 15 million pounds, located in Scotland. The estate is said to have been in litigation for fifty years and has increased vastly since that time. Mr.s McNabb has a cousin in London who had looked up the fortune and claims that the Morris people are some of the rightful heirs. Mrs. McNabb was a Ferguson and the fortune is said to be coming to the Ferguson and Steel families from an uncle or great uncle. There were clues here that helped me narrow my search for the truth. With the date of this article, I confirmed the trip actually took place with ship records showing Jeanette sailing to Liverpool at an unknown date and returning to the U.S. on December 11th, 1909. The article also states they traveled to England, but the fortune was located in Scotland. Another helpful clue was that the case had been in litigation for 50 years. A follow-up article appeared in the paper a few months later after Jeanette and Joe returned home. "Mrs. Harry McNabb and her cousin Joe Steel have returned from their trip to England where they went to look after some property which is to be inherited by them on the death of a very aged relative"
This article sheds some new light on what happened after their trip. The inherited estate could not be claimed due to the ancestor connected to it had not died yet. I have heard relatives talk about the family’s refusal to talk about what happened after they returned from overseas imply that they were embarrassed by being scammed or not being related after all. When I went to pick up the mystery box I had heard about through an ancestry.com member, Bette (who had held on to the box for a few years) mentioned there was a letter addressed to someone named Jeanette. I was ecstatic because Jeanette was someone who I had very little information about and thought maybe there would be some clues about where my Ferguson roots came from in Scotland. As I took out the letter and began reading, I was floored. I couldn’t believe what I was reading. If you lived in Morris, Illinois anytime during the last 90 years, you’ve heard of Sklut’s. Chances are it was the only place you went to buy a suit or clothing for a special occasion. Last year, Sklut's ended its nearly 90 year run and closed its doors for the final time. Patrons of the store flocked to its final sale at 307 Liberty Street last November to get one last glimpse of the iconic locale. Sklut's was founded by Abe Sklut, a Russian immigrant who came to the U.S. in the early 1900’s. His father, Albert, came to Morris first and went into the junk dealer business with his brother-in-law. A few years later, Albert’s wife Freida, Abe and the rest of the family joined him. The Sklut family first appears in the 1910 Census living with Anna’s sister and her family, the Menchers. Abe was interested in the retail clothing business from the very beginning. His first job was at Goldstein’s shoe store located at 216 Liberty Street. Later he went on to work for Gold’s, a clothing store also in town. Abe opened Sklut's after graduating high school at 414 Liberty Street. On September 8th, 1928 he officially opened its doors. An ad in the newspaper called Sklut's “A new store for women and boys’ clothing in the community of opportunity!”. They advertised high quality Oxfords for $3.95 and men’s dress shirt for $1.95 and $1.65. In 1944 Abe moved the store to its more well known location. He sold the business to his brother Harry in 1966. While Abe died in 1970, Harry and his nephew Ben continued to run the store after his death. It’s last owner Jim Riebe, purchased it in 1985 and officially closed its door in Noveber of 2016. Sometime this August, 307 Liberty Street won’t be vacant anymore. Montage Wine Bar and Spirits currently at 304 Liberty Street across the street has purchased the store and is currently renovating it to make way for a new and improved location that offers wine, craft cocktails, live music and more room for events. I had the chance to sit down with the owner, Michelle Xydakis, to get the latest on the new space. Michelle began working at Montage in 2009 on a part time basis. In 2013, her boss Ginger Hollenbock offered her a partnership in the business and she accepted. By 2015, Michelle bought Ginger out and has been the sole owner ever since. Montage’s current location has a great vibe that Michelle hopes to continue across the street. When Sklut’s had their “Quitting Sale” in 2016, she was contacted by Pam Sklut Keller and asked if she’d be interested in purchasing the space. Michelle was estatic to accept this great opportunity to expand Montage to a bigger space that offers more to its customers and the Morris community. She is dedicated to preserving the history and some of the original features in the Sklut’s space, while updating its interior to reflect the vibe she’s looking for. She’s been continually impressed by the condition of the building through the renovation process and quality of the materials used so long ago. I had the chance to take a peak inside and get a glimpse of some of the remnants from the Sklut store in years past. Check out the Montage facebook page for updates on when the new location will be open. Montage is celebrating its final night on Wednesday July 26th before they take some time off to transition to the new space. Are you a business owner interested in your company's history or the history of your building? Contact us today for details on research projects and how to be featured on our blog. You may have photographs that contain the faces of people you know are your ancestors, but have no clue who they are. It's not typical for an old photograph to be labeled and even then there may only be a first name or minimal information. A few weeks ago, I talked about finding secret treasure in your attics (or basement, or grandma's house!). There were hundreds of different family artifacts contained within the box I found including photographs, post cards, greeting cards and letters. I couldn’t wait to figure out who everyone was! In my personal genealogy, the Ferguson family has been a consistent brick wall for me the past 10 years. A distant cousin has also been working on the origins of the family in Scotland with no luck for close to 30 years. The patriarch, William Ferguson who was born in Scotland, married his wife Mary Steele in Illinois in 1857. The family had 7 children including my great grand father (the baby) Thomas Ferguson. Unfortunately, we have no idea where William came from in Scotland, his parents names or any details about him at all prior to his marriage in 1857. One of the children of William Ferguson and Mary Steel was Mary Jane Ferguson Espley. We don't know too much about her except that she was born in 1868, the fifth child of William and Mary. William Ferguson and family. Mary Jane is the youngest in her mother's lap. She later married Thomas Espley in 1891. They had one child Mary Ellen Espley born in 1894. Sadly, shortly after this Mary Jane died of measles. Sometime later, Thomas and his daughter Mary Ellen went to England to visit his parents. Tragically while visiting, Mary Ellen died in England at her grandmother's home in Salford, Lanchashire at the age of 3. One of the photos in the hundreds of unidentified photos I have has always stuck out to me. Its not typical to see an old photo of a man and a young chid. It seemed possible that the picture could be Thomas Espley and his daughter Mary Ellen, but there were hundreds of photos in the box that covered at least 8 or 9 different families, plus photos of friends and neighbors. Over the past few months, my mind kept drifting back to the picture with the overwhelming feeling that this had to be Thomas and Mary Ellen. I have never seen a picture of either of them before and I hadn't done any research into when the photo was possibly taken based on the clothing or hairstyles, but something still nagged at me about that photo. I reminded myself to check my books for the style of clothing to give me a clue as to when this picture could have been taken. The next day, I went to the Grundy County Historical Museum. If you haven’t visited the Museum and have ties to the area, it is a great way to connect with Grundy County history. The museum has a number of old albums dating all the way back to the 1850's through recent times. I decided to begin searching through them to work on a project of indexing all the photographers in Morris and when they were in operation to help others figure out how to date and identify their photographs. I came to one book of the Grand Lodge of Illinois (Masons) book that held photos of its members from the 1800's and early 1900's. As I looked through I noticed someone familiar on the second page. I quickly turned over the back of the photo. "T.J. Espley". I pulled up the scan of my photo and they were nearly identical! It was obvious that the previous photo was Thomas J. Espley and his young daughter during the short time after his wife Mary died and she was still alive. With this information I was able to date this photograph to either 1895 or 1896. Thomas, Mary Jane and Mary Ellen's story seems to have been revealed in such remarkable ways that I can't help but feel like their story was reaching out to be told. Mary Jane's grave in Evergreen cemetery simply says Mary Jane daughter of William and Mary Ferguson. I never knew she was married until I started looking into the marriage index. From there I discovered that she was married to Thomas Espley and for several years that was the extent of what I knew about her life. Later, while looking for probate information for her father William Ferguson, I stumbled upon the probate file of Mary Steel Ferguson. William had failed to properly disperse his wife's assets to the children and a court date was set to determine who were the rightful descendants. In the probate file, the original copy of Mary Ellen Espley's death certificate in England was found. The court record explained that Mary Jane had died shortly after her mother's death and her daughter a few years after that and therefore were no descendants down that line to distribute money to. It was a long road to finding the identity to that picture, but the journey was well worth it! Send us a message here if you need help identifying your mystery photographs There are dozens of clues we can utilize to tell a story from the picture alone. I had the chance to chat with Thomas about what inspired him to so diligently preserve Yorkville's history. My last blog highlighted the great work Thomas is doing to keep Yorkville's history alive. How did you get into local history and genealogy? I got into genealogy through my own family because it's something my grandparents always talked about. I loved hearing about all the people in my family and all the wonderful stories and photos. For Yorkville, I live in the home of the Marshall family who started the Kendall County Record, so it was just a given to be interested in my houses history! Another person who lived in town and well known by everyone, Dr. Frank Loomis, who was the town veterinarian! So many people came up to me saying "oh you live in Doc Loomis' old Home!" What a cool feeling. Maybe one day people will say that about myself living there! What does the future hold for the Yorkville Then and Now project? I am hoping to put together a small coffee table book in the next year of all the Then and Now photos I have taken. I am taking the rest of this year to collect photos and search through people's attics, basements and write down as many names and stories I can that I can include with the book. It's something very special to me to do it right and include as many people as I can so people in town, can relate to it personally and have fun showing it off to their families and friends. What's life been like since your project became public? The response has been AMAZING! I have received hundreds of old photos of Yorkville. So many people have been open and welcoming me into their homes and sharing their priceless family photos. What's very interesting about this project, is that I'm collecting photos of town and the people who grew up here that you may recognize, that people have never seen. It's families personal life's that I have had the privilege to put out there in such a way that so much thought and detail has to be put into it for it to be done right. So much positive feedback and thank you's for preserving the towns history has been given from those families and it means the world to me. Some of the people I have collected photos from are people I have know for 10-15 years and I treat it as special as I would my own family photos. I am looking forward to whatever else may come my way and some great photos. A few months ago I caught a segment on WGN about a man from Yorkville, Illinois who had an passion for local history in his hometown of Yorkville, Illinois. Thomas Milschewski takes existing historical photographs, anywhere from 20 to over a hundred years old, holds them up to the real life locations that still stand (or if they've been demolished where they once existed) and snaps a photo. Almost my entire family is originally from Morris, just south of Yorkville on Route 47, so it was nice to see someone so passionate about their local history in small town rural Illinois. I messaged him on Facebook to let him know I thought his project was unique and congratulate him on his press coverage and success of his photographs. We got to talking a little bit about our research interests. I happened to be doing a research project for a client and distant relative who has roots in Yorkville. When I mentioned the family name and the store they owned, Thomas was ecstatic! We discovered that his current house was directly across the street from the family's home. Not only did he have old pictures of the house, but several of the store downtown as well. I shared the information with my relatives and they were able to provide a great photo of the house that Thomas currently didn't have. He created a new photographic by walking outside his house, holding it up to his neighbor's house and snapping a picture transforming my great uncle and his brothers to the front porch of their house once again. Thomas currently lives in a house on Heustis Street. It happened to be built by the original founder of the Kendall County Record newspaper. He has collected photographs of his own house, neighborhood and downtown from his own collection, current and past residents of Yorkville and with the help of the historical society. He began the Yorkville Now and Then project in March of this year. I took a trip down to the Law Office in downtown Yorkville where Thomas had an art show last week displaying his fabulous photographs printed on canvas. It was great to meet my new genealogy friend in person and see his work up close in print. He's currently taking pre-orders for his work and they are a must have for anyone interested in Yorkville History! To see more of Thomas' work you can go to his facebook page here and check out his fantastic photos from all over Yorkville. If you'd like to read more about how Thomas got interested in local history and what's next for his project, you can read about it here. When I was 14 years old I remember finding an ancient looking photo album in my grandmother's basement. She knew it had belonged to my great great aunt Lizzie Kay (her husband's aunt), but she didn't have a clue who any of the people in the photographs were. She suspected it was the Kay family who we weren't directly related to. As we leafed through the 25 + photos of the album I was mesmerized by the faces who at some point were important enough to put into an album over 100 years ago and now were unrecognizable to anyone alive today. We scoured the back for labels and tried to find family resemblance in each photo. As we got to the back of the album, we pulled out the photo from the insert. Tucked behind the photograph, perfectly preserved, was a handwritten letter from 1904. From that point on I became mildly obsessed with old photographs. I began a quest of collecting every old family photograph I could get my hands on. I hit the jackpot a few years ago when I randomly got in contact with someone through Ancestry.com who had a box in her possession that also belonged to Aunt Lizzie Kay. I met the woman at her house and it was filled with hundreds of photographs, postcards, greeting cards and letters. Not only was this a collection of her belongings, but also her sister's that died before she did. As I continued to look through the box, I started noticing that there were things in there about my grandparents. I was confused at first because this box belonged to a different generation, how did my grandparents things get in there? I asked the woman who had rescued the box where she had gotten it. She said a friend of hers was helping someone else clean out their attic while they were moving. He noticed an old box in the corner and looked through it and saw the Kay family name (who this woman was related to) and thought she'd want to see it. I put the pieces together and realized that Lizzie Kay had left her house to my grandfather when she died in 1944. My grandparents lived there and decided to move out in 1950, just 3 months after my father was born. They had left this box in the attic for over 60 years. Somehow it remained preserved, it wasn't thrown away and it made its way back to me. During the next few weeks I'll be posting about what I discovered in the box and how I used it to help with my genealogy research. In the meantime, check your attics, basements, and other nooks and crannies. You never know what treasures you may discover!